• There are few signs in Jerusalem to show that the Christmas season is here, apart from a few Christmas lights twinkling along the section of the Hevron Road where it leads into Bethlehem. Jerusalem Christians have, however, not been forgotten. In mid-December Mayor Nir Barkat toured the Christian Quarter of Jerusalem’s Old City to give religious leaders and residents Christmas greetings and good wishes for the New Year and in the days running up to Christmas, a cheerful Father Christmas has been seen, walking along the Old City walls with a large selection of Christmas trees, inviting Christians to select one as a free gift from Jerusalem’s municipality. The Minister of tourism hosted a traditional pre-Christmas reception for the leaders of the Christian churches and communities in Israel at Jerusalem’s Mishkenot Shaananim. More Christians than ever before gathered in Bethlehem on Christmas Eve to celebrate, it was estimated that at least 70,000 people had visited the little town by the end of the day. • According to the Ministry of Tourism, 75,000 tourists were due to arrive in Israel over Christmas of which 25,000 are Christian pilgrims. The Ministry of Tourism provided free transportation to Christian pilgrims traveling between Jerusalem and Bethlehem. 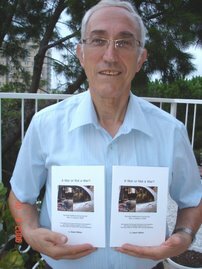 • The collaboration between Israel’s Department of Health and the West Bank is little known. In 2011, 197, 713 healthcare permits were issued to Palestinians and their companions, 21,538 Palestinian children were treated in Israeli hospitals and 118 training courses took place in Israeli hospitals to provide training and support for medical teams from the West Bank. The Civil Administration, along with Israeli hospitals and donor organisations arranged various ‘fun days’ for Palestinian children hospitalised in Israel. The venues included the Jerusalem Zoo, the Safari Park at Ramat Gan, the beach at Haifa, bowling in Holon, and a trip to see the snow on Mount Hermon which was arranged by the Israeli Army Alpinist Unit. • The recent heavy rains have gone some small way to relieving Israel’s water shortage, Water Authority officials calling the winter of 2012- 13 the wettest since 2004. The Jordan River is now fuller and flowing faster than it has for 20 years and since the first of the winter’s rainfalls at the end of October, the level of the Sea of Galilee, one of the countries primary sources of water, has risen by 26 centimetres. Mount Hermon received 30-40 centimetres of snow, unusual for so early in the year. In the ongoing battle to provide enough water for Israeli citizens the Israeli government together with Water Authority are building desalination plants and cleaning contaminated and obsolete wells so that water can once more be pumped from them and it is hoped that these measures will cover the water deficit within two years. In recent years, 220 new water reservoirs have been built or are in various stages of completion, thanks to these reservoirs, Israel currently recycles more water for agricultural usage than any country in the world. • During the recent attacks on Israel by thousands of Grad Rockets fired from the Gaza Strip, the efficiency of the Iron Dome system in intercepting very many of them was much praised. Few people have any idea that parts for these state-of-the-art systems were manufactured by residents of a home for people with mental disabilities. Abie, Ida and Michael have been employed by the Rafael company in the production of the Iron Dome system for over a year, as part of the company’s community outreach programme. The Hostel’s manager stated that the residents delivered highly accurate products that measured up to the company’s high standards and the Social Affairs Ministry is very proud of the project, “We believe that everyone is entitled to live and fulfill his or her potential,” said the Director General of the Ministry. • India is probably the country with the largest cow population in the world yet most of its dairy farms operate using antiquated methods this, however, is about to change as Israeli kibbutz members have been called in and two Israeli companies have begun planning and constructing 10 state-of-the-art dairy farms on the subcontinent. In Hinduism, cows are sacred animals and there are specific laws for protecting them which the Israeli teams are having to consider when designing the farms. So while ideas will be introduced to increase the number of cows kept and the quantity of milk produced, the farms will contain hostels where older cows can receive special care and alarm systems will be installed to notify the farmers if a cow suffers even the slightest distress. • Click on this if you want to know how Israel has been feeling in recent weeks. "In our hearts we are all Hamas." Anat Berko. Gatestone Institute. 20 December '12. As one veteran Fatah member said, "In our hearts we are all Hamas." Contrary to what many people think, there is no profound division between Fatah and Hamas. Palestinians often shuttle from one to the other; members of the same family belong to different groups. Jibril Rajoub, for example, is often interviewed by the Israeli media as representing Fatah (Palestinian Authority), while his brother, Naif, was a minister in the de-facto Hamas administration. Before 2007, when Hamas took over the Gaza Strip and suppressed the Fatah presence there, there was a considerable amount of back-and-forth between the organizations. On one occasion a Fatah operative in jail smiled and said he found it hard to say which organization he belonged to. "There are days," he said, "when I go to sleep Fatah and wake up Hamas..."
Last week, masses of people marched through the streets of the West Bank holding green signs with Hamas slogans, all with Fatah's blessing, and chanting, "death to the Jews," and "death to Israel." As one veteran Fatah member said, "In our hearts we are all Hamas." Mahmoud Abbas's so-called "pragmatism" is music to Western ears, but not to the Arabs'. Thus, when he came back from the UN with the title of "president of Palestine" in his pocket, he allowed Hamas and others to hold parades and rallies, released Hamas prisoners, and has given instructions that those planning terrorist attacks against Israel are to be left to do as they please. Today the Palestinian Authority can barely stay afloat, and every mass march organized to palliate Hamas can slide into factional Palestinian violence and anti-Israeli terrorism. Hamas, with the help recently and willingly given it by Mahmoud Abbas, will take over, just as it took over the Gaza Strip. Israel can never accept a radical Islamist emirate in the West Bank of the sort Hamas has created in the Gaza Strip, any more than Paris, London or Washington could accept al-Qaeda or the Taliban in Monaco, Wales or Virginia. This time, no one can promise that Israeli soldiers will continue to act as bodyguards for Palestinian leaders when their lives are threatened. That movie, which we have all seen, is no longer playing. Do You Understand our Neighborhood? “...there is an unspoken question in the mind of virtually every Israeli that you need to answer correctly: ‘Do you understand what neighborhood I’m living in?’ If Israelis smell that you don’t, their ears will close to you. It is one reason the Europeans in general, and the European Left in particular, have so little influence here”. Every time Israel tries to give up land for peace it ends up being attacked by Palestinian missiles and criticized by the international community. This happened following the withdrawal from Gaza, when Hamas made targets of civilians throughout Israel. It happened when Israel left the “buffer” in South Lebanon and Hezbollah, armed by Iran, aimed rockets at schools and hospitals in the north. Defense” operations speak to that! Prime Minister Netanyahu told members of the foreign media that when the Hamas leaders openly called for Israel’s destruction the only thing he heard was a deafening silence. “Where were the UN resolutions? Where was President Abbas? “Why weren’t the Palestinians summoned to European and other capitals to explain why the PA president not only refused to condemn this but declared his intention to unite with Hamas? The West doesn’t understand what is going on here—what this neighborhood is like. President Obama and the European Union, having failed to see that the Arab Spring could turn into a bitter winter, are now in the strange position of apparently supporting a dictatorial Egyptian regime led by the Muslim Brotherhood, at the expense of the opposition which is seeking democracy and religious freedom. Opposition politician Mohamed ElBaradei stated, “Adoption of a divisive draft constitution that violates universal values and freedoms is a sure way to institutionalize instability and turmoil”. And the West is in a quandary over Syria, wanting to rid it of mass-murderer Bashar Assad, while trying not to hear the calls for jihad being yelled by many of his opponents – “calls so bloodcurdling you don’t need to be fluent in Arabic to understand them”, as Liat Collins observed in the Jerusalem Post. The emergence of the Syrian National Coalition and the associated Joint Military Council means that the West and its allies are now backing a Muslim Brotherhood dominated coalition as the replacement for the Assad regime. The leader of this coalition is Ahmed Mouaz al-Khatib who is closely associated with the Damascus branch of the Muslim Brotherhood. He has a long history of anti-Semitic, anti-Western and anti-Shi’a remarks (he praised Saddam Hussein, for example, for “terrifying the Jews” and wrote an article asking if Facebook was an “American-Israeli intelligence website”). The Brotherhood is by far the best-organized single body within the coalition. Could things have been different? As with Egypt, perhaps, if the West had perceived the risks and opportunities clearly at the start. This might have triggered a vigorous policy of support for non- Islamist opposition and fighting elements, which were there. The result is that the force now facing the retreating Assad regime is split between differing brands of Sunni Arab Islamism – some aligned with the West, some directly opposing it, but all holding fast to fundamentally anti- Western ideologies. It is always appropriate close on an optimistic note. Israel is a strong country. We are a true democracy with a strong economy. Our life expectancy for both Jews and Moslems is among the highest in the world. There is much to be proud of. But while the miracle of Hanukkah was being celebrated downstairs, a modern-day miracle was happening on the second floor. Tal Zilker, a 17-year-old cancer patient from Southern Israel, was chatting with his new best friend, Qsuy Imran (prounounced ‘Hussai’), a 17-year-old boy from Gaza. “Chatting” may be stretching it a bit to describe the boys’ interaction. Zilker can say, “Are you in pain?” and, “When’s your next treatment?” in Arabic. Imran can manage “Do you have a fever?” and a few cuss words in Hebrew. But when you’re a teenager, vocabulary is nowhere near as important as being ambidextrous. Zilker is from Ashdod, a city in Southern Israel. Imran is from Khan Yunis, in Gaza. During the seven days of “Operation Pillar of Defense” last month, Hamas fired more than 1,400 rockets into Israel, most of them aimed at the Ashdod-Ashkelon area. The Israeli Defense Forces (IDF) struck more than 1,500 sites in the Gaza Strip, a tiny patch of land twice the size of Washington, D.C.
To make things even more complicated, many of the Israeli doctors who treat these patients are also soldiers in the IDF, in which service is mandatory. In fact, Dr. Dror Levin, the oncologist treating Zilker and Imran, spent the entire week of Operation Pillar of Defense patrolling the border with Gaza alongside the rest of his reserve platoon. Despite the bloody battle raging between their governments, Zilker and Imran seemed less concerned with geopolitics than with playing a game of virtual soccer, their favorite pastime. The two met in May, when Zilker came in for his biopsy. An MRI done just days earlier revealed a tumor in his left knee. Imran was the first person he met at the oncology floor of the hospital. The fact that Imran had the same cancer that Zilker was suspected of having, in the exact same place, made their meeting—as they say in this corner of the globe—“bashert”: meant to be. Imran’s father, Jihad, whose name incidentally means “holy war” in Arabic, became their unofficial guide through the difficult maze of doctors and treatments. “This terrible fate brought us together in a way that’s hard to explain,” said Anat. Jihad says Anat has been a ray of hope for his family as well. Being a resident of Gaza, he and Imran are not allowed to leave the hospital except for a few organized trips. For the last 10 months, Anat has been bringing him and Imran home-cooked meals and clothes. Being so far away from his family and friends, he turned to Anat and her son for comfort. “One of the only good things to come out of this is the fact that I found a new family,” said Jihad, referring to the Zilkers. When the rockets began flying over Israel in November, Anat rushed to make sure the Imrans were OK. She was a bit worried at first about how the war would affect their newly formed friendship. “I wanted them to know it didn’t matter to us and that we loved them,” she said. “I knew it wasn’t their doing. Imran wasn’t worried either. The only argument they’ve ever had is who’s better at PlayStation. They’re still fighting about that. Both Zilker and Imran are getting ready to return home. In both cases, doctors were able to successfully remove their tumors. Imran says he’s looking forward to school, but the first thing he’ll do is dust off his soccer ball and hit the playground. Zilker is planning a trip to California. What is Hamas actually celebrating today? 25 years sonce their inception? How about all the terro targetting Israel? Under each of the comments below is a link to a video which shows the true face of Hamas. Amd Abbas wants us and the UN to believe he is seeking peace? Do me a favour. 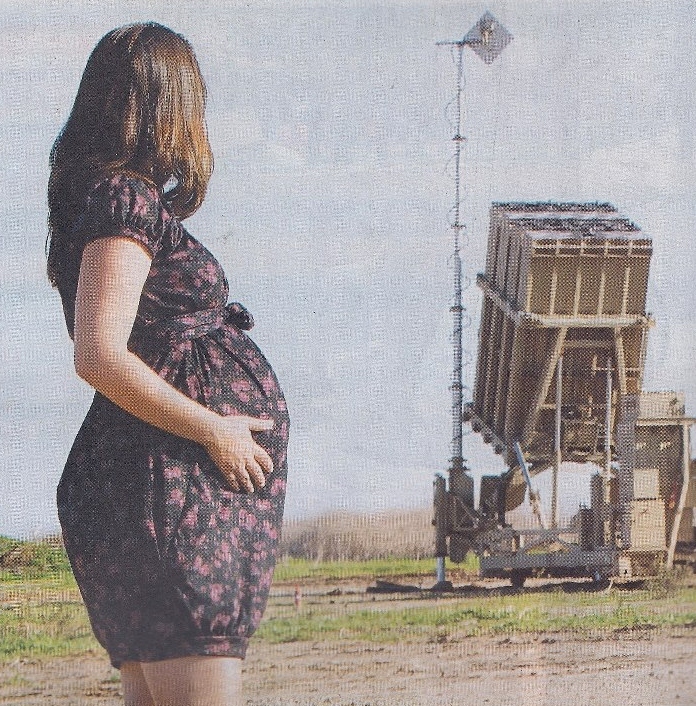 Pregnant woman in 9th month directed deployment of Iron Dome battery to defend Tel Aviv. Maariv 30.11.2012 features a photo of HIla, the 28 year old head of the testing division responsible for the testing and transfer of Iron Dome batteries to the Air Force who is in her 9th month of pregnancy (expecting to give birth next Sunday). The battery was completing a series of testing at the testing field when Israel assassinated Ahmed Jabri. The team realized that they could close the gap between testing and deployment and in the course of 60 hours were able to deploy the Iron Dome battery to defend Tel Aviv. Hila is an aeronautical engineer married to an Air Force officer. When her husband’s commander told him he was sending him home to be with his wife as she was about to give birth, he replied that his wife wasn’t home. The November 29, 2012 UN vote to upgrade the Palestinian Authority (PA) to a "non-member observer state” – in violation of the 1993 Oslo Accords - was an expected derivative of Israel's policy towards the PA since 1993 – critical concessions, retreats, indecisiveness, submission to pressure and appeasement. What has Israel done since 1993? a) the legitimization, importation and the arming of 60,000 Palestinian terrorists from Sudan, Iraq, Yemen, Libya, Syria, Lebanon, Jordan and Tunisia b) the evacuation of Gaza and 40% of Judea and Samaria – resulted in unprecedented Palestinian hate-education and incitement, terrorism and non-compliance. The flabbier the Israeli policy and the frailer the Israeli response to Palestinian terrorism, the more flagrant is the Palestinian abrogation of agreements. a) 270 Israelis were murdered by Palestinian terrorists between 1978 and the 1993 signing of the Oslo Accords, compared with some 2,000 murdered since Oslo, mostly by PLO terrorists. b) In 2000, Prime Minister Barak offered to uproot all Jewish settlements; Mahmoud Abbas and Arafat responded with unparalleled wave of suicide-bombings in the pre-1967 area of Israel. c) Prime Minister Sharon's 2005 uprooting of 25 Jewish settlements in Judea and Samaria and Gaza induced an unprecedented barrage of missiles on pre-1967 Israel. d) Israel's inaction in the face of the 2009-2012 amassing of long-range missiles in Gaza triggered a daily barrage of missiles at pre-1967 Israel. The post-Oslo conduct by Mahmoud Abbas and Arafat – role models of intra-Arab subversion and international terrorism, Holocaust deniers and allies of the Communist Bloc, Khomeini, Saddam Hussein Bin Laden, North Korea and Hugo Chavez - has reaffirmed that the PLO does not change its spots, only its tactics. Mahmoud Abbas is not troubled by the size – but by the existence – of the Jewish State in the Middle East. The systematic Palestinian effort to leverage terrorism and diplomacy, in order to eliminate the Jewish State, behooves Israel to resurrect the steadfastness and defiance which characterized most Israeli Prime Ministers from Ben Gurion (1948) through Shamir (1992). a) Israel should extend Jerusalem's municipal lines, which is a prerequisite for the transformation of Jerusalem's steady decline into long term growth, through a dramatic upgrade of Jerusalem's infrastructures of transportation, industry and housing. c) Israel should embrace the former Supreme Court Justice Edmond Levy Report. The July 2012 report reconfirmed that according to international law, Judea and Samaria are not "occupied territory,” since no foreign entity was sovereign in the area in 1967. The 1949 Fourth Geneva Convention is not applicable since it prohibits the coerced transfer of people to settlements, while Israeli settlers have settled of their own volition. Israeli settlements in Judea and Samaria are legal. The Jewish State's historical and legal rights in Judea and Samaria are based on the 1922 British Mandate. These rights were preserved by Article 80 of the U.N. Charter, which provides continuity of Jewish rights in the Jewish Homeland. And, the report calls on Israel to allow construction in the settlements, enabling Israelis to directly purchase land in Judea and Samaria. d) The Israeli law should be applied – and transportation infrastructure should be upgraded in area C, which is controlled exclusively by Israel according to the Oslo Accords. e) All VIP benefits, by Israel, to all Palestinian officials should be annulled, pending the elimination of hate-education and incitement from the PA education, divinity and media sectors. Such steps would trigger international resentment and possibly sanctions. However, pre-1993 Israeli defiance, under harsher circumstances, was initially condemned, but then rewarded with an enhanced posture of deterrence and respect. It demonstrated that Israel would not sacrifice dire national interests on the altar of convenience and wishful-thinking. For example, Prime Minister Ben Gurion defied the 1948/1949 US pressure/embargo to refrain from a declaration of independence, to "end occupation of the Negev” and to avoid the incorporation of – and construction in – Jerusalem and declaring it the capital of Israel. Prime Minister Eshkol dared the 1967 US pressure against preempting Egypt and the reunification of – and construction in – Jerusalem. Prime Minister Golda Meir withstood the 1970 US pressure to repartition Jerusalem, authorizing the construction of four more neighborhoods, the home of some 150,000 Israelis. Prime Minister Begin defied the 1981 US threats and punishments, applying Israel's laws to the Golan Heights. Prime Minister Shamir rebuffed US pressure to freeze settlements, but US-Israel strategic cooperation expanded unprecedentedly. Will contemporary Israeli leaders follow in the footsteps of Ben Gurion – Shamir? Or, will they sustain the self-destructive Oslo state of mind, ignoring the Palestinian reality and that in the Middle East either you eat from – or become part of – the menu? So the real deal is this. Israel’s legitimacy is not recognized by the Palestinian leadership. It is conditional and it is conditioned upon alleged prerequisites (of a right of return and the end of a Jewish state) that have not, and will not, be met. The Palestinian narrative is a fiction. It is deliberately crafted to mirror that of the Jewish people, beginning with the biggest lie of all — that the catastrophe of the creation of the state of Israel is equivalent to the Holocaust. Israel is alleged to be akin to apartheid South Africa, so that its legitimacy is continually in jeopardy. After all, the South African regime had to be destroyed by lethal politics. And the whole point of the exercise was to legislate — that is, impose — results on Israel on Palestinian terms. Negotiations are a joke. The U.N. will do Palestinians’ “negotiation” for them. No wonder the outcome was met by the loud applause of a room full of the representatives of dictators and thugs (the majority of U.N. members are not full democracies), and NGO/“civil society” hacks who had been brought in by the U.N. Division for Palestinian Rights. (A letter of Division Director Wolfgang Grieger states that he had personally reserved at least 100 spots in the gallery.) Sitting in the gallery myself, I noticed that during Abbas’s lengthy speech the outbursts of clapping across the gallery would commence before the translation of Arabic sentences into other languages had finished. It was an exercise in what one might call Benghazi-style spontaneity. The only question that remains, therefore, is this. Now that decades of Palestinian intransigence and belligerence have been richly rewarded by the U.N. majority, how soon will Palestinians start targeting and harming Israeli Jews with impunity again? . So once again, as in World War ll, based on the fact that all European countries did not have the guts to vote (apart from the Czech republic) , Israel and the Jews are being cast into the wind. Now FIFA is pledging to rebuild the soccer stadium in Gaza that the IDF targeted during Operation Pillar of Defense (original story is here on FIFA website, near the bottom of the page). 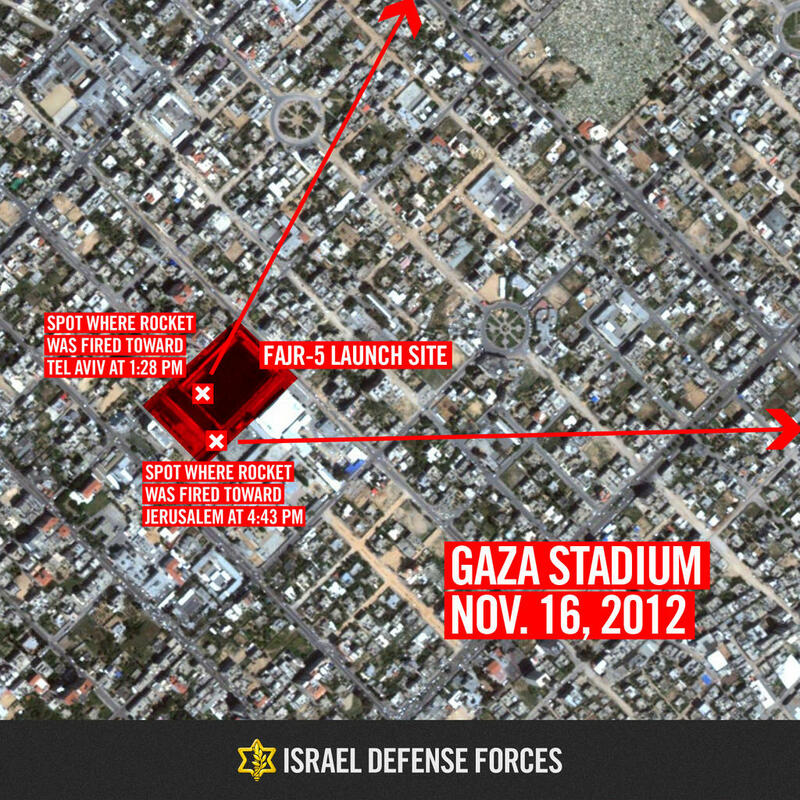 Does FIFA not know that the reason it was targeted was because it was used as a long-range rocket launching site? This is the site from which rockets were fired toward Tel Aviv and Jerusalem. Below is the infographic about the stadium. A summary of the simply dishonest reporting that is on going whenever Israel responds to the constant provocations by Hamas can be seen in this short video. Summary of "Pillar of Defense"
With the ceasefire agreement regarding the fighting in the south coming into effect following eight days of operations, it is quite clear that, in spite of the “victory celebrations” going on in Gaza, the IDF has surely accomplished the main goal in Operation Pillar of Defense of inflicting severe damage to Hamas and its military capabilities. As a result of IDF operations, the command and control apparatus of Hamas was significantly struck and the targeting of broad terrorist infrastructure, facilities and military bases, as well as the destruction of dozens of smuggling and explosive tunnels. 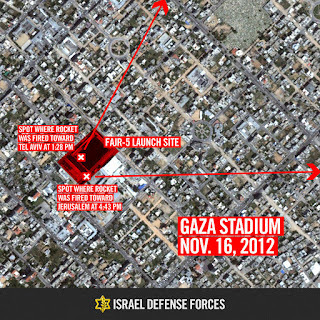 During the operation, the IDF damaged and destroyed significant elements of Hamas' strategic capabilities, among them. Amongst those capabilities were long-range (over 40 km) and hundreds of short- and medium-range rocket launchers. These actions have severely impaired Hamas' launching capabilities, resulting in a decreasing number of rockets being fired from the Gaza Strip. The 'Iron Dome' defense system has accomplished high rate of successful interceptions (84%) and Hamas' accuracy with regards to hitting populated areas within Israel remained below 7%. IDF soldiers, in regular and reserve military service, gathered in assembly areas and prepared for the ground operation. Their time was used for training and improving their operational capabilities. i) dozens of long-range rocket launchers and launch sites. • Suffering from PTSD : ? • In the past 24 hours, a rocket landed in the Safari Center of Aleh Negev-Nahalat Eran and another rocket injured one of our workers in a direct hit to her car on her way to the night shift in the village. • Residents have been sleeping in sheltered rooms in Aleh Negev and Aleh Moriah in Gedera, including highly-dependent residents requiring round-the-clock nursing care. • Homeland Security and VIP officers visited the village to review safety measures in effect, while social workers provide ongoing support to staff. • A Day Care center opened in Aleh Negev for children of workers. The children happily interacted with young residents from the hospital wing. • Although school is officially closed; vocational programs and therapies are being held inside residences or sheltered rooms. • Aleh Bnei Brak has taken in 2 disabled youngsters from the south of Israel; they are currently staying in the residence and attending the school on premises. The facility remains on high alert; all residents are moved quickly and efficiently into protected shelters when sirens sound. • Evacuation procedures were practiced in Aleh Jerusalem after the code red alarm sounded on Friday night. A dedicated team of volunteers signed up to sleep in the residences every night. • In addition to absorbing disabled people from the southern region who lack shelters in their own homes, Aleh Negev is currently caring for a Thai man who was injured in a previous rocket attack near the Kissufim Crossing. During every siren, staff provide him with lots of emotional and physical support. The Palestinian and the "Settler"
Location:- Friday night, Shabbat, the synagogue in an Eastern Gush Etzion settlement. We hear an alarm on Friday night. We think and wonder, but do not do anything. Then a loud explosion is heard. Sirens of the security forces are sounded and messages broadcast on the need to find shelter. Then there is another alarm, and this time everyone runs downstairs to the room underneath the synagogue to take cover. Children and grandchildren in our arms to get down as soon as possible. The phone rings. The Emergency squad member holding the mobile phone which is on although it is Saturday and answers. The voice is a voice he is used to hearing. The voice on the line speaks with an Arab accent: "Pinni, Shabbat Shalom," says Muhammad, with panic in his voice. "Pinni, an alarm has sounded and there are explosions, what are we supposed to do?" Muhammad is a friend of Pinni, from a neighboring village, an Arab village. They have no shelter and are not aware of the rules behavior under missile attack. Pinni explains to Muhammad that we are under missile attack from Gaza, and to go inside his house and to stay away from windows. "Thanks Pinni," admitted Muhammad and apologized that he had called on Saturday. This is reality, Arab "Palestinian" calls to a befriended "settler" to get instructions on how to defend himself against his brother Palestinian offensive missiles from Gaza. With the remarkable success rate of interceptions, the Israeli developed “Iron Dome” system is attracting attention from many corners of the globe. Success rate currently 90%, over 265 missiles intercepted. And what does Hizbollah possess? The long standing shortage of medicines and medical supplies in Gaza stems primarily from a dysfunctional relationship between the Palestinian Ministries of Health in Gaza and Ramallah. The conflicts between the two offices have resulted not only in a shortage of medicines and supplies, but also in restricted access to medical treatments for patients outside of Gaza. 1. The CLA works to ensure that patients from Gaza have the access they need to get medical treatments. 2. Of the thousands of patients that requested permits to enter Israel for medical treatments, 99.3% were approved. Patients were only denied permits when it was determined that they could receive necessary treatment inside Gaza (Sept 2012). 3. From January to October 2012, more than 14,500 permits were issued by the Gaza CLA for patients and their chaperones to leave Gaza through the Erez Crossing. 4. All the requests for medical supplies (equipment and medicine) submitted by the international community to the Gaza CLA have been approved for entry into Gaza. 5. On average medical supply requests (medicines and light equipment) are approved within a span of 24-72 hours. Coordination of approved medical supplies is completed within one working day after the organization submits the intended day of import. 6. Since September 2012, international organizations, in coordination with the Gaza CLA, have impoted 32 trucks of drugs and medical supplies through Kerem Shalom Crossing. This has included spare parts for dialysis machines, helium for MRI machines, and three fully equipped ambulances. An additional five loads of medicine were imported into Gaza through the Erez Crossing through special coordination. 1. The restricted medical supplies in Gaza are marked by a shortage of 400-500 varieties of medical equipment (out of a defined 700), including a shortage of surgical and anesthetic equipment. 2. There is an average shortage of 33% of desired types of drugs at any given time. 3. According to the World Health Organization, the process of referrals for patients from Gaza to receive treatment in Israel, the West Bank, and Jordan was suspended for nearly 10 days due to disagreements between the Ramallah and Gaza Health Ministries. As a result, a 38% reduction in monthly referrals left several hundred patients without necessary treatment. 4. The WHO reports that due to the failure of the Palestinian Ministry of Health to pay its accruing debts to Jordan, Jordanian hospitals refused to accept government referrals of patients from Gaza. 5. Medical suppliers are often reluctant to sell supplies to Gaza since there are issues with non-payment. 1. Gaza hospitals are reported to be at 80% capacity, only slightly higher than intake then during routine periods. 2. On November 17th, the Coordinator of Government Activities in the Territories updated Hassin el Alshich that, despite the problematic security situation and the ongoing rocket fire, it would be possible to transfer medical supplies into Gaza. 3. Tomorrow morning, 18 November 2012, 10 Red Cross trucks with medical supplies and one UNRWA truck are scheduled to enter Gaza via Kerem Shalom Crossing. Two trucks have been designated as being of particular importance as they are carrying much needed anesthetics and bandages. 4. Since the start of the operation there have been two reported incidents of light damage to medical facilities due to shocks from Israeli air strikes on terrorist infrastructure in the vicinity. a. Light damage to windows and doors of the Al-Quds hospital and the nearby Palestinian Red Crescent station in the Gaza district. Two Al Quds workers also sustained light injuries. b. Light damage to windows in the Al-Karma hospital in the Jabaliya District. The following letter from a traveller to Eilat reflects the matter of fact nature of life in the shadow of the threat from Gaza. I'm in flight now between Tel Aviv and Eilat. (I'll send this email when we land). In the distance off to the right we just saw two rockets launched from Gaza toward Beer Sheva and we saw Iron Dome missles launch and intercept them. This is quite unreal. They were pretty far away so we heard nothing - just these distant streaks of light racing up Many years ago in combat I saw both incoming and outgoing missles. While it was kind of cool the reality of that situation was very stressful. The disconnect was the same as even then it seemed that I was in some sort of a sci fi movie although the pain and death were too real. Before taking off I checked with staff and although could not reach everyone as the telephone system is cracking under the over use which is beyond capacity. Everyone was ok as of 30 minutes ago. Pilot has just announced air raid sirens going off in Beer Sheva - I can see flashes of what looks like red lights - pilot back - 8 rockets launched from Gaza and 8 direct hits by Iron Dome missiles. One of the problems is the vast amount of weapons, especially missiles, that were raided from Libyan army bases after the fall of Ghadafi. The new Egyptian government, headed by Muslim Brotherhood, has opened the border from Egypt to Gaza to allow these weapons in. This war will be controlled in a weird way by Hamas. Israel prefers that it would end now by as Hamas escalates Israel shall escalate. I fear Israel will be suckered into another ground war. The crazy reality of the Taliban in Afghanistan and Pakistan, AQ in Iraq and Libya, Hizballah in Lebanon and Hamas in Gaza is that the more they are attacked the more volunteers they get. As they have a death-cult culture, where they glorify death as actually being the better life and goal of life, they are in a sort of no loss position. So while the natural instinct is to keep hitting Hamas harder and harder until they stop shooting, the strategy is also counter-productive. Isn't this like a Greek myth? Something about Hercules fighting this 7 headed dragon where every time he cut off a head two would grow in its place. I can't remember how he prevailed but maybe it was lifting the dragon off the ground ? Well we are approaching Eilat now so have to sign off. 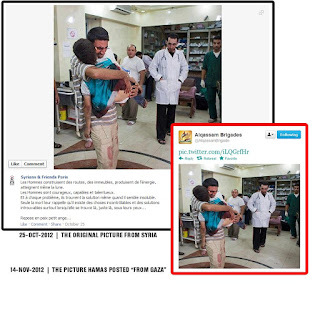 Once again in the conflict with the Palestinians, the media is being manipulated with photos and videos that are either false or taken at a different time or place. There will probably be many more such Pallywood picturess in the coming weeks. Finally the government has taken steps to stop the incessant rocket fire on southern Israel. Already this year close to 900 rockets have been fired. that is an average rate of 3 per day. 1) The goal of Israel’s operation is clearly defined and is aimed at removing a strategic threat to Israeli citizens. Israel is not interested in a deterioration of the situation. 2) Israel has demonstrated great restrain for a long period but cannot stand for the recurring attacks on its citizens. No other state would accept a similar reality. 3) Israel is acting in self-defense and out of its duty to protect its civilians from terrorist attacks. 4) Hamas rules the Gaza Strip and is responsible for all that occurs in Gaza and all that is launched from there. 5) It must be noted that Israel disengaged completely from the Gaza Strip in 2005. The result of Israel’s disengagement is that Gaza has become a giant ammunition dump. In addition, it provides a breeding ground for terrorist groups to organize and to operate, including groups associated with al-Qaeda and Global Jihad. All this under the rule, responsibility and sponsorship of Hamas. 6) Weapons smuggled from Libya, Iran and Sudan accelerated the process of Gaza turning into a terror base. These weapons also increased the danger posed to the Israeli population. 7) Hamas and the other terrorist organizations hide among the civilian population of Gaza. They also deliberately direct their fire at the civilian population of Israel. These acts constitute a double war crime. 8) The targets of the Israeli operation are all military. Israel will make every effort to prevent harm to the civilian population of Gaza, and regrets any injury to civilians. 9) e border crossings from Israel to the Gaza Strip remain open, allowing for the routine passage of goods and humanitarian aid. 0) The international community must act to stop the attacks on Israel from the Gaza Strip and should not wait for an Israeli reaction to act. Time and again, Israel has warned that it would not tolerate these attacks. See in the video below the pinpoint accuracy of the targetting of Ahmed al-Jabari and the minimum collateral damage. And now HAMAS is looking to escalate the conflict further as we see in the video below the Farj-5 missiles being loaded into and underground launch site. These missiles are capable of reaching Tel Aviv. On March 8, the Guardian published “International Women’s Day highlights hurdles obstructing women“, (co-authored by 12 Guardian correspondents, including the paper’s Jerusalem correspondent, Harriet Sherwood), on the subjugation of women around the world. Sherwood’s contribution, on the abrogation of women’s rights in the region she covers, didn’t mention female genital mutilation, honor killings , an endemic culture of misogyny, nor the impunity granted to men who physically and sexually abuse their spouses, throughout in Gaza and the PA.
Harriet Sherwood not only ignored the egregious violation of womens’ rights in the Palestinian territories, but, instead, devoted 118 words to the alleged injustice meted out to a female Palestinian terrorist affiliated with Islamic Jihad held in an Israeli jail named Hana Shalabi. 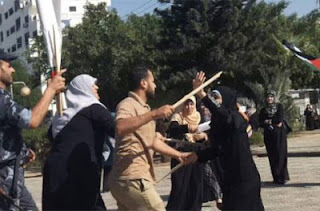 Hamas police violently attacked a group of women who were peacefully protesting on Tuesday in front of the Palestinian Legislative Council in Gaza. The women were calling for Palestinian reconciliation and sent a request to protest to Hamas which was ignored. 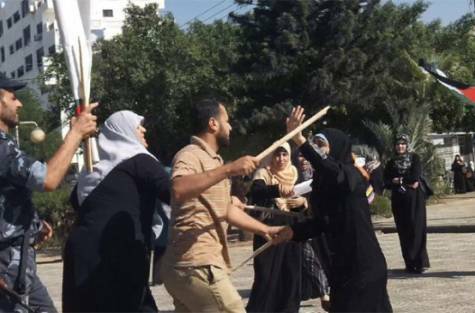 Using sticks and batons, Hamas police attacked the women and dispersed the protest. The protest, organized by women’s organizations including the general union of Palestinian women, was held outside the parliament building. Iktimal Hamad, a member of the union’s secretariat, told Ma’an that police ordered protesters to leave the area. “Women refused to leave, because this is a right for every human being to express their opinions and demand their rights,” Hamad told Ma’an. “We were verbally insulted and hit by fists and sticks. Police tried to arrest some of us but despite that we will continue with our campaign which calls for ending the division,” she added. Journalist Samya al-Zubeidi said female police officers hit her and ordered her to stop filming. “They beat me up, in addition to female police officers, (male) police officers also attacked women protesters,” al-Zubeidi told Ma’an. However, any negative publicity for the Palestinian cause in response to the beating of peaceful female protesters in Gaza could only be created if “liberal” media institutions such as the Guardian actually reported the story. The physicians have promised that in an Israeli national crisis, they will come here to help––for example, by taking the place of surgeons and other hospital doctors who have been called to the battlefront. The physicians were given a survey of Rambam’s disaster management network, and also voted with their feet by touring the Emergency Room and the Sammy Ofer Fortified Underground Emergency Hospital http://www.rambam.org.il/home+page/Support+Rambam/Needs/Capital+Projects/Sammy+Ofer+Underground+Emergency+Hospital>. “I’ve spent several years trying to learn best practices in emergency department disaster preparedness,” said Dr. Peter Sananman of Penn Presbyterian Medical Center. “This was a great opportunity to learn best-in-class systems and processes from those who’ve learned from experience." The delegation was sent to Rambam by the American Physicians Fellowship for Medicine in Israel http://www.apfmed.org/ (APF, est. 1950). The organization’s flagship program gives fellowships to Israeli doctors for advanced clinical training in the USA and Canada. The APF also annually sends members to Israel for an Emergency and Disaster Management Course offered in conjunction with the Ministry of Health and the IDF Medical Corps. The APF is the only North American body designated by the State of Israel to maintain an Emergency Medical Volunteer (EMV) Registry. Most recently, Registry members took part in a nationwide Israeli drill testing the health care system's preparedness for a massive earthquake. “Their response to the simulated call-up was phenomenal," says APF Israel Director Amir Blumenfeld, MD. "Sixty-eight physicians immediately volunteered to be in Israel within forty-eight hours." The Arab media is waging an unrestrained and vicious campaign against a small group of Christian Arab youth who wish to serve in the Israel Defense Forces. Two weeks ago, a conference was held at an Upper Nazareth community center for 121 Christian 11th and 12th grade high school students, all residents of Nazareth, Upper Nazareth, and Arab villages in the Lower Galilee region, who had expressed their desire to enlist in the IDF, even in combat units. Every year, some 50 youths from the Christian Israeli-Arab sector enlist for military duty. After the conference, some Arabic newspapers and online news sites began a smear campaign against the participants, depicting them as traitors. Journalists wrote articles promising to "take care of them" and hunt them down. The Arab Orthodox local council in Nazareth announced that priest Jobrail Nadaf, who took part in the event and supports IDF enlistment among Christian Arab-Israeli youth, had been suspended from his duties as priest and excommunicated from his church for "cooperating with the enemy." The Israel Defense Ministry said in a statement that it "will not accept that people who work to promote this issue come under threat or attack, and it will act to grant the greatest possible aid and support to all those being threatened."